Was born in 1857. Boat-sailing is practically his only sport. He has visited the Far East and sailed in curious craft, including a Bermuda-rigged yacht in the Mediterranean. It is chiefly with the canoeing branch of nautical sport that he has been associated. For over twenty-eight years he has been a member of the Mersey Canoe Club, and has been Vice- and Rear-Commodore of the British Canoe Association, and Captain of the Hoylake Sailing Club. He is the author, among other nautical productions, of a book on Camping Out, and of the Canoeing volume of the All-England Series of Sporting Manuals. 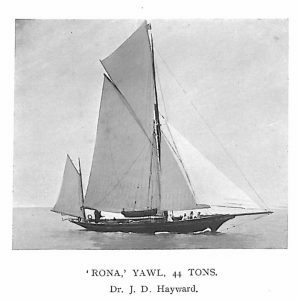 Rona, Yawl, 44 tons. Dr. J. D. Hayward. For many years he was devoted to single-handed sailing, and cruised alone in canoe yawls. In 1891 Anderson, of Millom, built the cutter Seaweed, 20 tons, in which he cruised about the West of Scotland and in the English Channel. 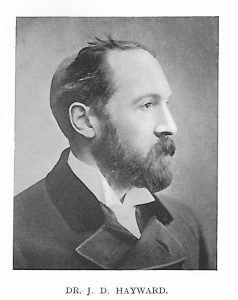 In 1902 he bought his present yacht, Rona, yawl, 44 tons, built by Stow and Son, in which he has made extensive cruises off the English, Scotch, and Irish coasts. Clubs: Royal Mersey, Hoylake Sailing Club. Residence: Leyfield Priory,West Derby, Liverpool.